A Homemade Living | A girl, a whisk and a pair of scissors! Hey Everyone! I hope you’ve all been having a good summer! It’s been a good one here so far, one with the most beautiful sunsets I’ve ever seen! 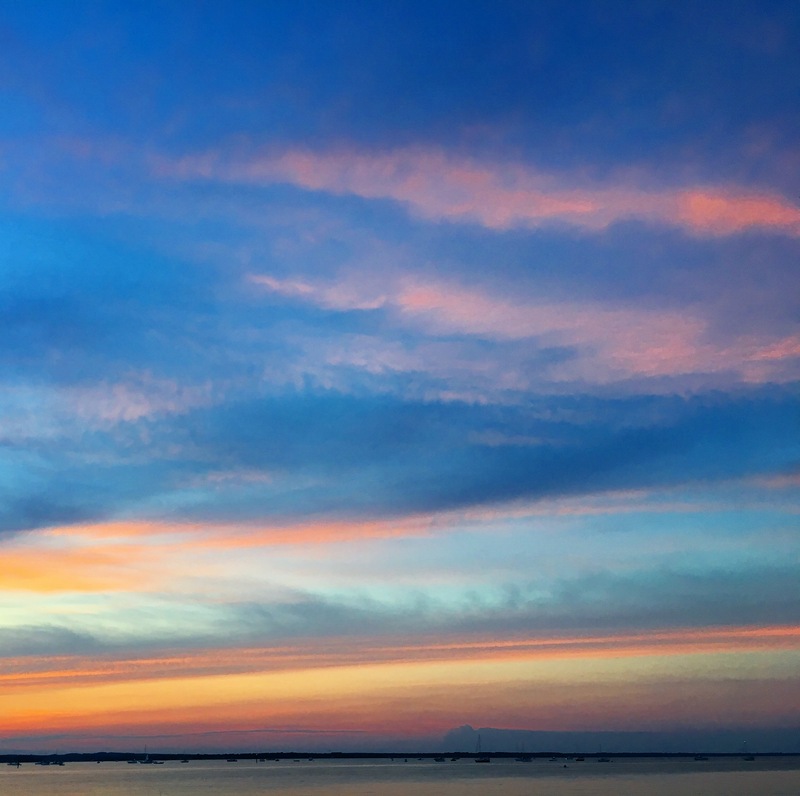 I love summer sunsets, when the sky turns candy colored shades of pink and fiery reds and golds all within minutes, until the sun suddenly disappears like the curtain dropping on a dramatic performance. The other night, my husband and I took a little drive down some country roads (which there are not many of here in the DC area) and somehow wound up in a little town down by the Chesapeake Bay. Everybody seemed to be walking to a small park by the water, so we got out of our car and followed them, as you do when you see a random crowd of people forming! It turns out that everyone was going out to see the 4th of July fireworks, so we got out of the car, sat in the grass by the water and waited. All of a sudden the sun started setting and the sky turned the sweetest shades of pink, getting more saturated by the second, its bright colors reflecting in the water. It was the most beautiful sunset (scroll down to see a picture!) and the cheesy metaphor is that sometimes in life, without even planning it, and while driving around seemingly aimlessly, you stumble upon the best, most beautiful surprises. I hope your summer is filled with these moments, with beautiful sunsets, and, with delicious summer desserts obviously, which is what I wanted to tell you about today – these cupcakes! I used Ina Garten’s “Flower Cupcakes” recipe (I halved her recipe and got 18 cupcakes). This is a great recipe – the cupcakes are a little more dense and are not overly sweet, but still very rich in flavor! The recipe is very similar to Ina’s basic sheet cake recipe she uses for her Flag Cake, and I’m pretty sure it’s all the butter, eggs and sour cream that make these cupcakes so rich and delicious! Once your cupcakes are baked and cooled (make sure they are completely cool before you put the frosting on), prepare your frosting. (I loosely followed this recipe from Country Living, but made several adjustments.) First make your fresh strawberry puree. To do that, puree about a cup of strawberries in a blender, then pour the pureed strawberries through a sieve to get rid of the seeds (otherwise you’ll end up with seeds in your frosting), then set aside. Next, in your electric mixer bowl, cream together the softened cream cheese and softened butter until blended and soft and fluffy. Then, begin adding in your confectioners’ sugar, about a cup at a time (the recipe called for 4 cups of sugar, I used about 3 cups in total) until the frosting is thick enough to pipe onto your cupcakes. When you have your desired frosting thickness, add in the vanilla extract and about 4 – 5 tbs of the strawberry puree you made earlier (add in more/less depending on your taste). Mix until the frosting is smooth and turns pale pink, if it feels too thin add in a little more confectioners’ sugar to thicken it up. I refrigerated mine for about 30 minutes (in an airtight bag) because it’s easier to work with when it’s chilled. Now comes the fun part… decorating the cupcakes! 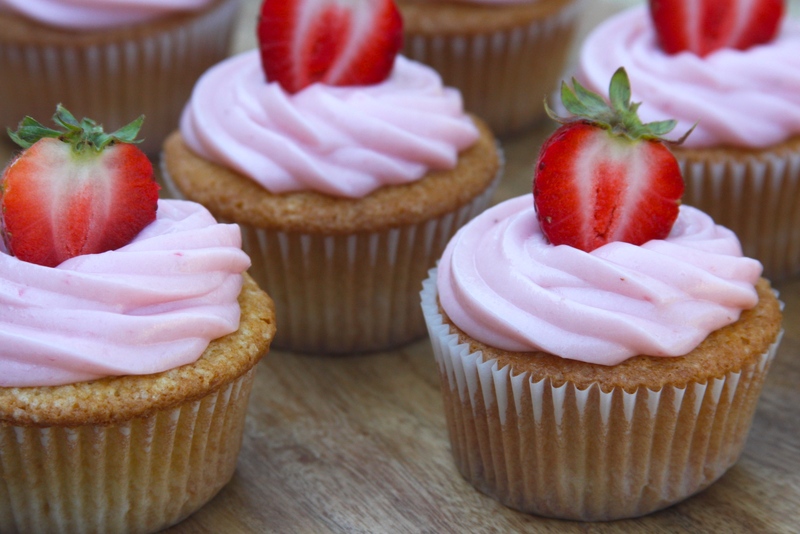 Cut some additional smaller strawberries in half to decorate the tops of your cupcakes and set them aside. Then, fill a piping bag (that has a large tip attached to it) with the frosting, and pipe it onto the tops. 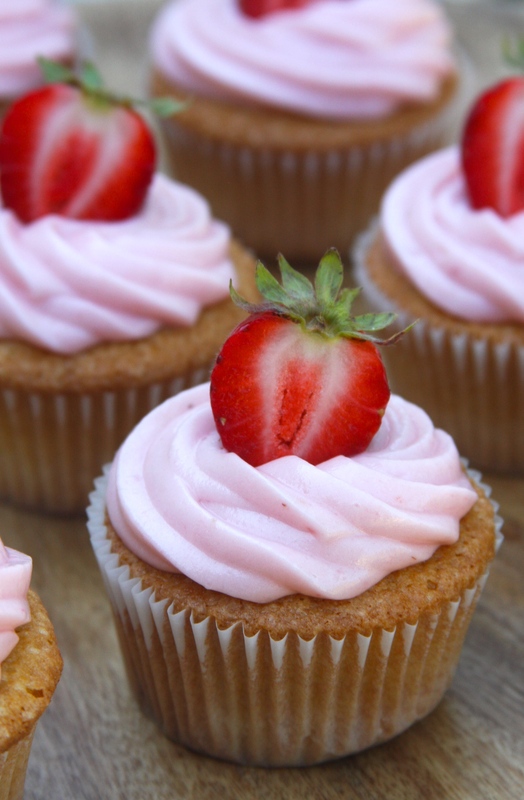 The frosting should be thick enough to hold its shape and hold the strawberry in the middle! These cupcakes are such a quick and easy summer dessert! 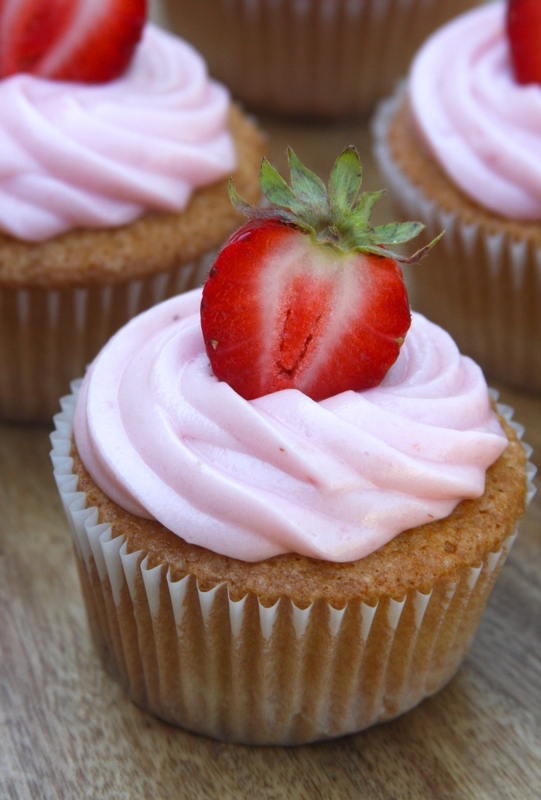 If you’re in a hurry you could of course just use a box mix to make the cupcakes, but the frosting is definitely worth making with the fresh strawberries… it doesn’t have that artificial taste and color, and is so simple & quick to make! The sunset I was talking about (above)! I hope you all have a great week, happy summer and happy baking! Thanks so much for stopping by today! Hey Everyone! I have something a little different to share with you today! Since I spend the majority of my time working with, thinking, talking, reading and daydreaming about beautiful interiors, not just because it is what I do for a living but also because it’s one of those things that feeds my soul, I wanted to share a little bit of it with you today! 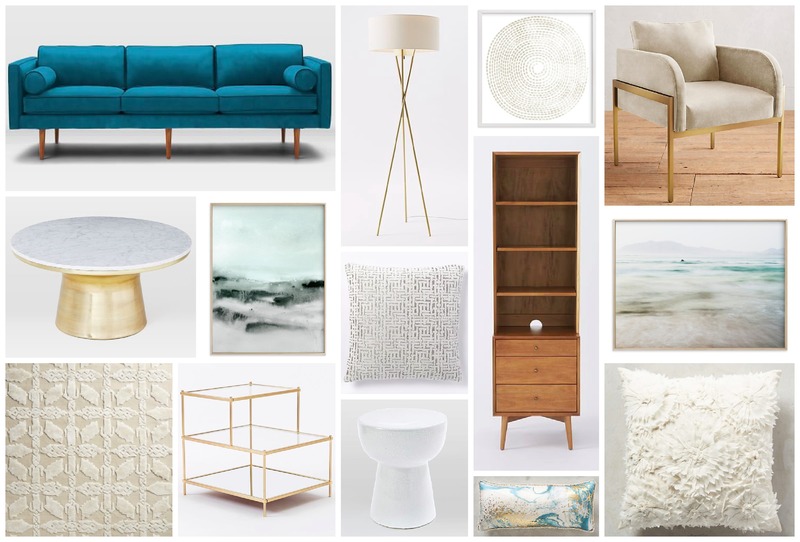 I created these five Living Room mood boards, each showing a distinctly different look for the same space, to hopefully give you some inspiration if you’re re-doing a space in your own home, are looking for a color palette to use, or just love looking at beautiful interior pictures like I do! Whether you decide to give your living room a simple update by using Yellow Cushion Covers and replacing your old coffee table, to redecorating the whole room, it is completely up to you. As long as you like what it looks like in the end, that’s all that should matter. You might also be interested in checking out these modern living room furniture sets to give you a better idea of what else you can do, and where you can get the furniture for your living room. Calming Neutrals – If I had to pick one of these looks that my eye is instantly drawn to, it would be this one. While I love bold, bright, saturated colors, I love a good neutral color palette, especially as the base for a room. When the big pieces in your space (your sofa, rug or any large piece of furniture) are neutral, it not only creates a balanced template for you to work with, it gives your space flexibility; this means that you can easily add and mix & match accent colors within your room without them interfering with your neutral basics. This is especially good if you like to re-decorate frequently… you know that whatever color you bring in, whether for seasonal decorating or any other time of the year, it won’t compete with your neutrals! I love the warmth that pops of gold add to any neutrals, but more on my love for and everyone’s current obsession with gold later! Textured Browns – I love how much variation and visual interest you can create in a room just by layering textures. People often think that you need to mix lots of different colors to make a space look interesting, but there is so much you can do within a fairly limited color palette just by using a variety of materials and textures. Layering these creates such a warm, lived in look, especially in this cozy brown color palette. 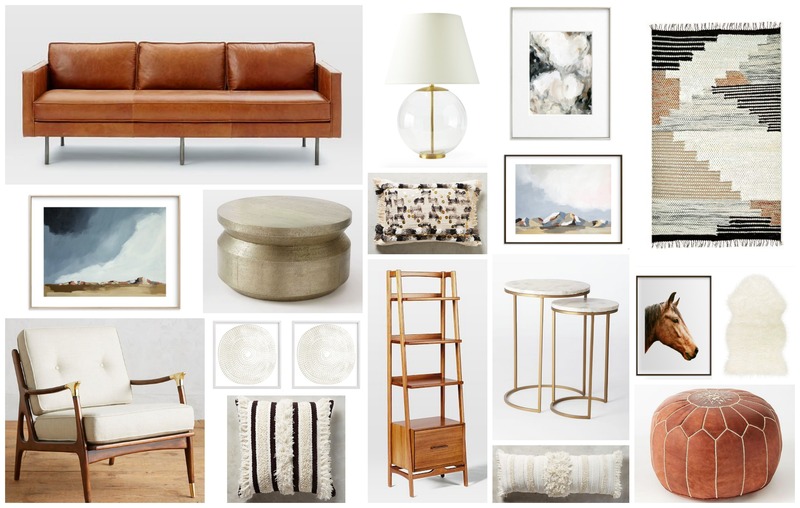 My favorite piece in this inspiration board is the rug (top right corner), because it mixes the browns, blacks, whites and grays in such a beautiful way, inspiring this whole color palette. Whenever I’m thinking about a room, it’s often a piece of furniture, a rug, a pillow or piece of art that inspires a color palette and acts as a springboard for more ideas. 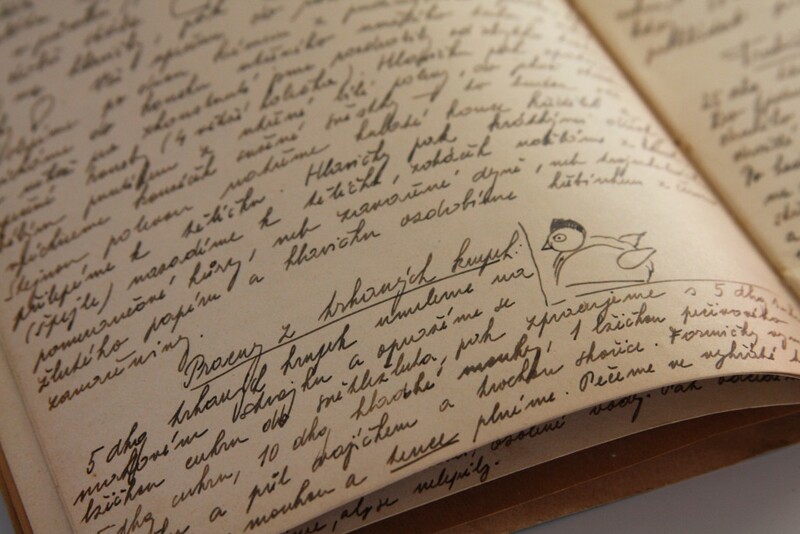 You can draw so much inspiration and information from just one object! Cool Blues – Blue is such a great color to work with, one of the reasons being that it works beautifully with both a warm and a cool color palette. Color is such a complicated and complex thing that it’s hard to condense its value and substance into just a short paragraph, but when it comes to color versatility in a space, blue (of which there are obviously hundreds of versions!) is one of the best colors to go with. 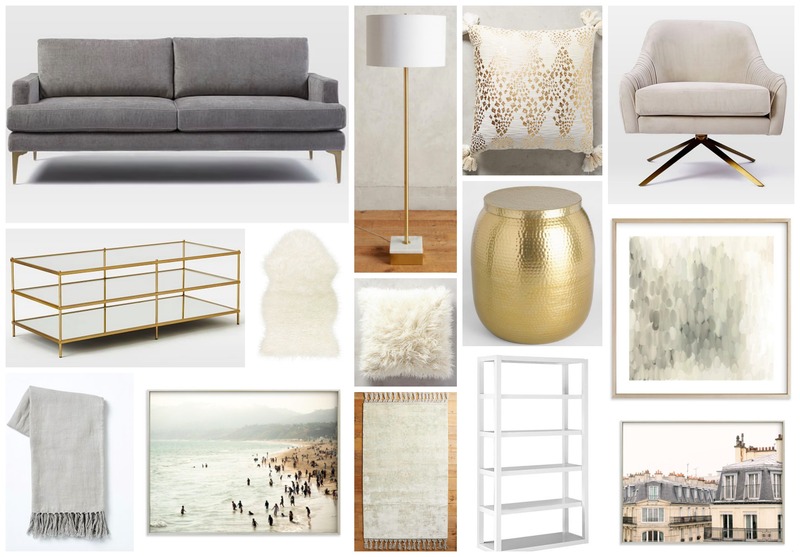 Pair it with whites, golds and sandy tones like I did in this Living Room look for a cool, sophisticated look or tone it down with warm greens, beiges and browns for a warm, earthy one… the possibilities are endless! Glam Pinks – This is another color palette that immediately speaks to me, because I love the color pink. Not the cheesy, kitchy pinks often associated with 90’s Barbie products, but the deep, rich pinks that make a space look feminine and sophisticated. I love the energy the color exudes and the fact that it feels both fresh and young, yet also timeless when paired with the right colors and done in the appropriate way. 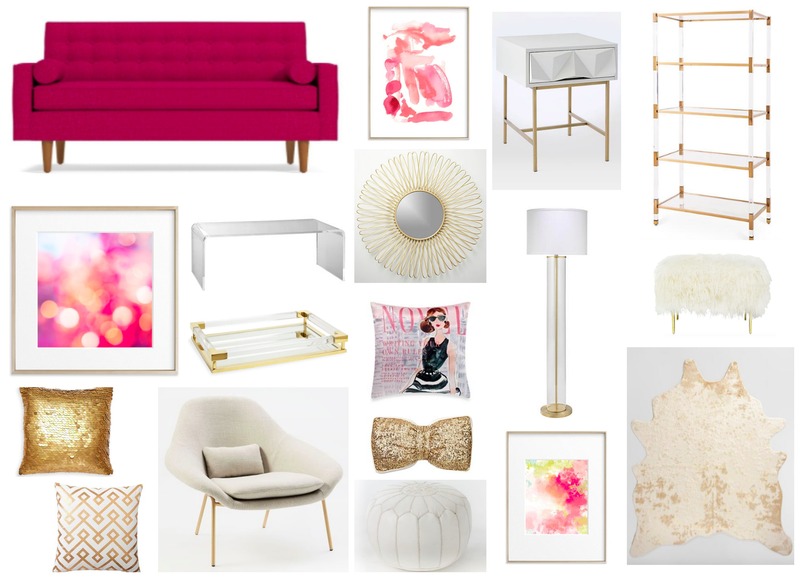 I built this inspiration board around the striking deep pink sofa, pairing it with lighter, more neutral pieces like the acrylic coffee table or bookcase and carrying the pink on throughout the room in smaller doses like in the artwork or accessories. This way, the bold color doesn’t become heavy or overwhelming, and you won’t get tired of it quite as fast! 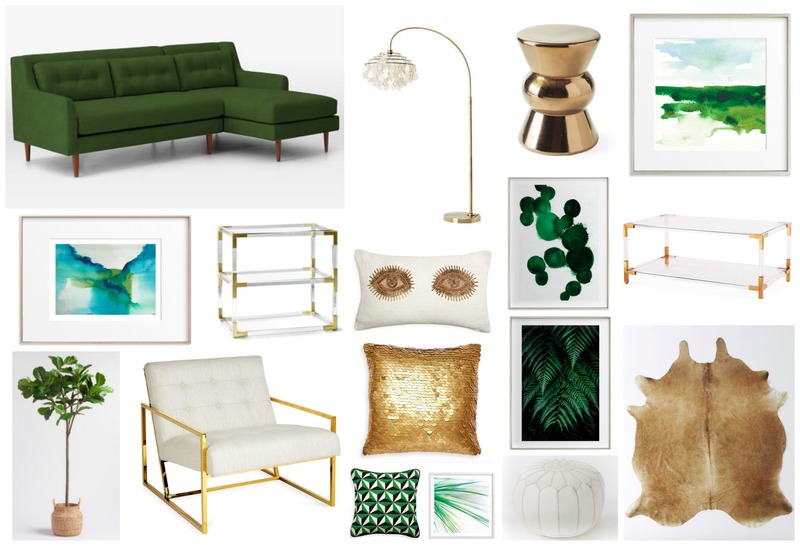 Dramatic Greens – Color is such a great way to add drama to a room, and this deep green which has an almost jewel like tone, is a perfect example of that! If you want to give a room a dramatic, sophisticated look this is the formula to use – a deep color popped with a highly contrasting one (like black & white in this case), paired with cool, shiny metallics! And boom! Such a striking, eye-catching look! While we are on the topic of eye-catching, my friend was telling me about how much money she saved by doing some energy comparison for her home energy. If you’re interested, compare energy now. 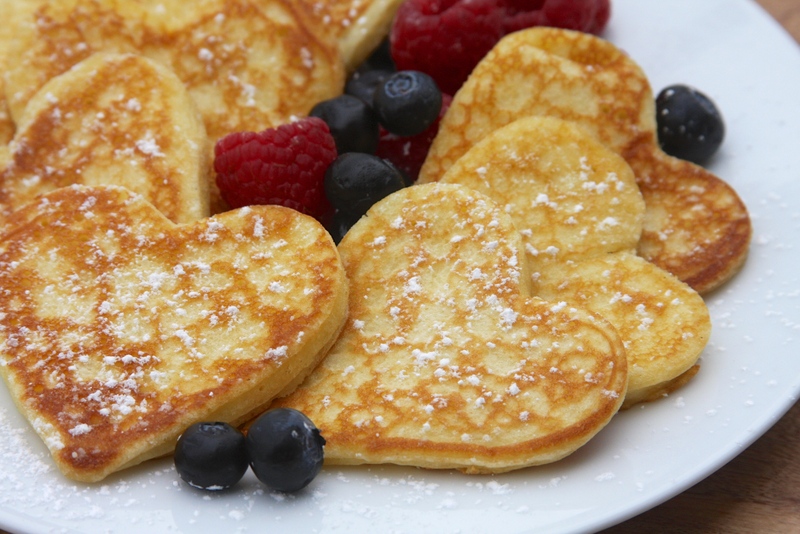 First, make your pancake batter. 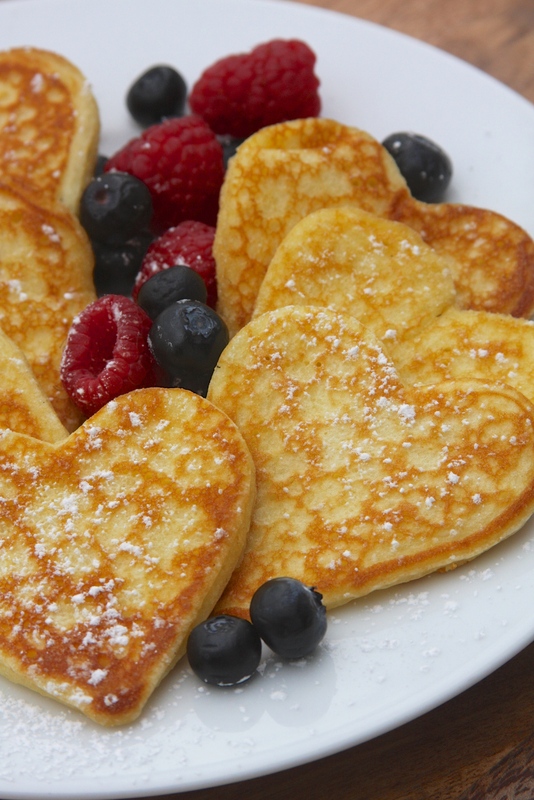 I poured my pancake batter into a measuring cup to make pouring it into the heart cookie cutters easier, but you could spoon it in too. Heat either your griddle or pan, and place the cookie cutter on it, then quickly spray the inside (mainly the sides) with some cooking spray, or brush with some oil or butter. 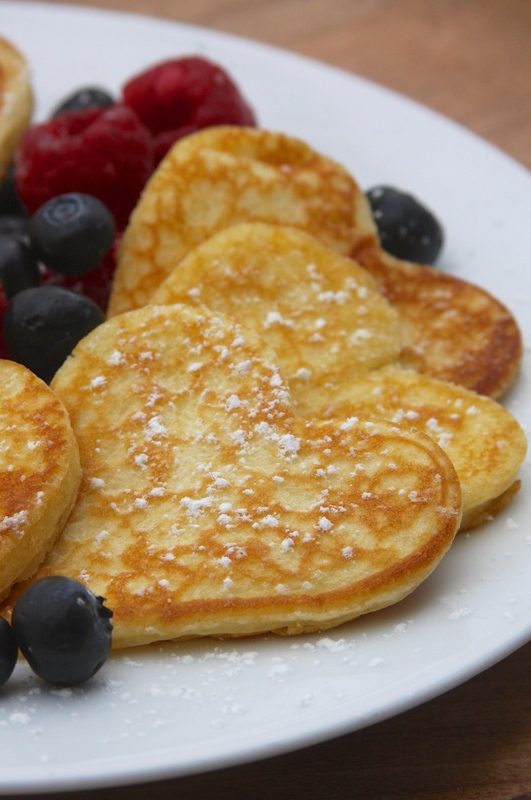 Pour in some pancake batter (don’t fill up the cookie cutter all the way to the top) and let the pancake cook until you start seeing bubbles on top. Using kitchen tongs, carefully grab the side of the cookie cutter (DO NOT use your hand as the cookie cutter will be very hot!) 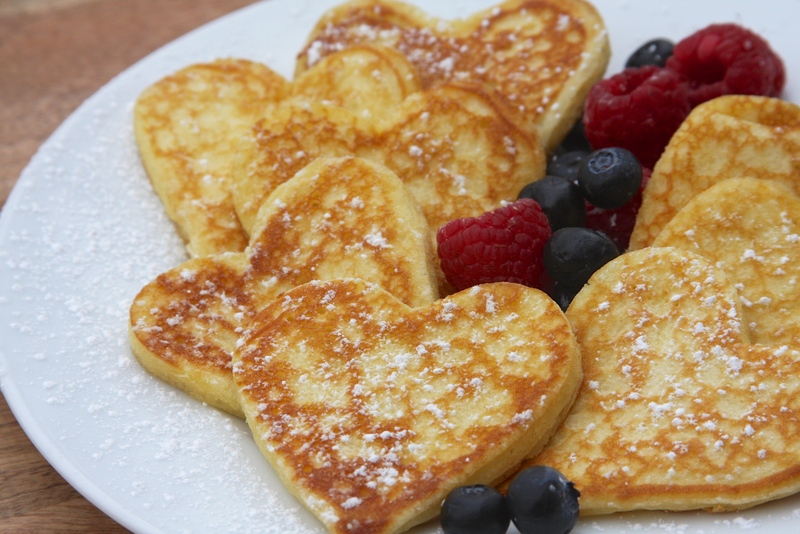 and gently pull it off (the pancake should hold its heart shape at this point), then flip the pancake and cook until done! 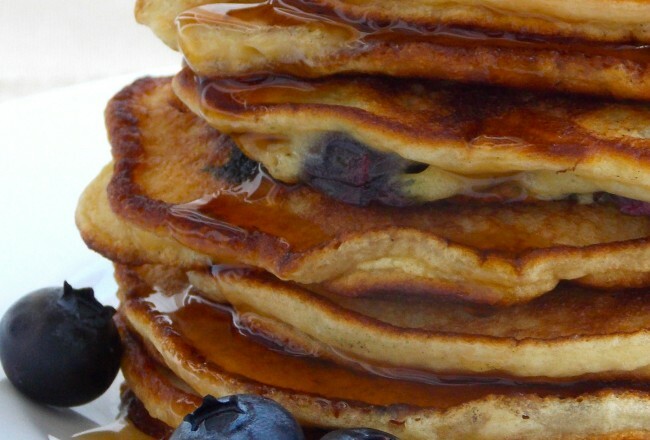 Keep repeating the process, then serve pancakes with fresh berries, a dusting of powdered sugar and maple syrup! 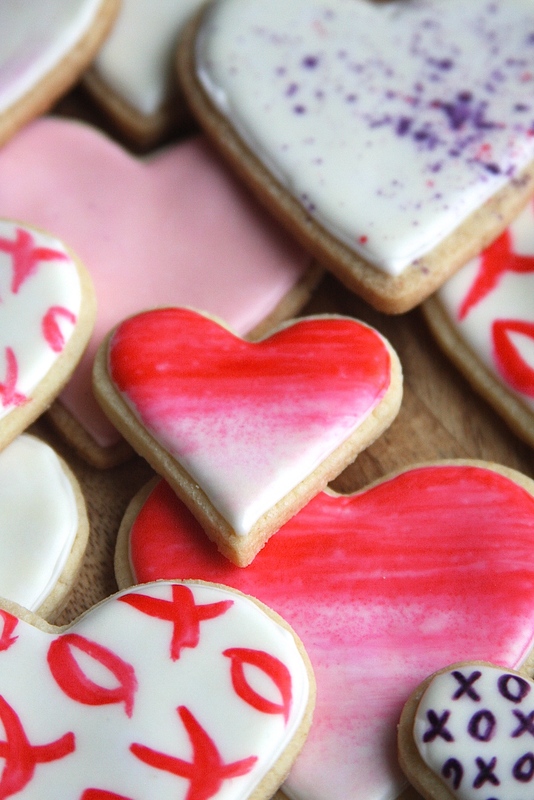 For another fun heart shaped Valentine’s Day treat, check out these Valentine’s Day Watercolor Heart Cookies! Hey Everyone! It’s a beautiful sunny Saturday morning here, I can hear birds chirping outside the kitchen window and it feels like spring has started it’s long journey towards us! 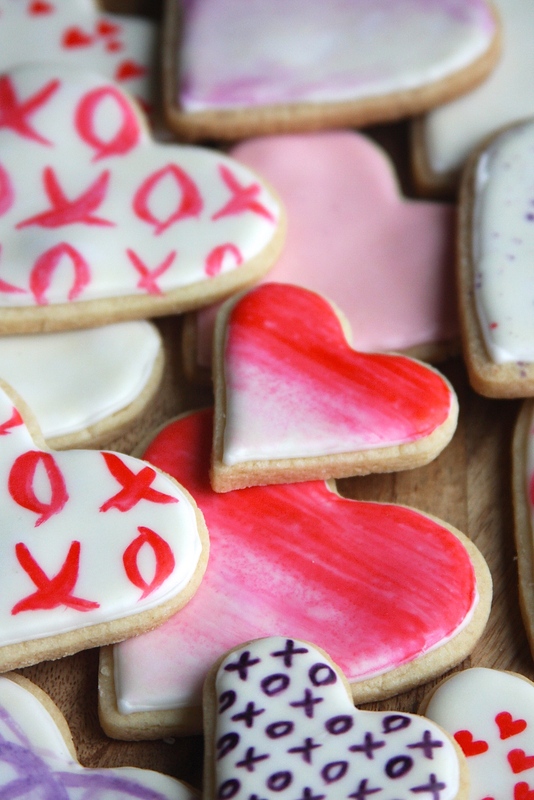 I hope that February has been off to a good start for you… it’s been a busy week here, but I wanted to stop by and show you these fun Valentine’s Day cookies today! I love that everything turns pink in February. Because I love anything pink any time of the year, I love Valentine’s Day. 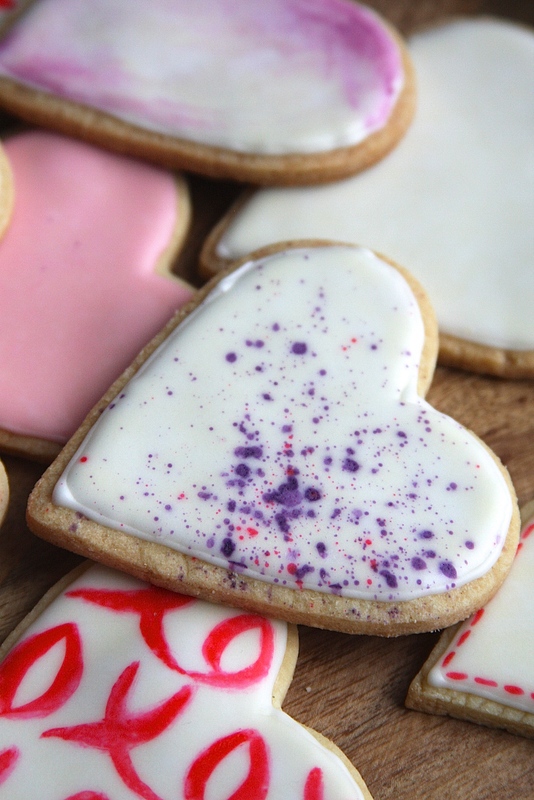 These heart shaped sugar cookies are so fun and easy to make; all you need to do is bake basic sugar cookies and cover them with icing, and then get creative painting them with food coloring as you would paint a watercolor picture! 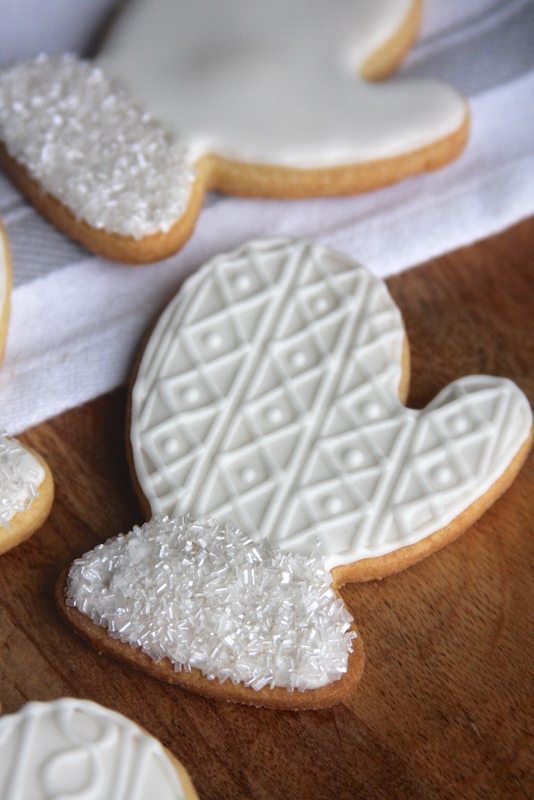 It’s a fun technique and an easy way to personalize cookies, too! 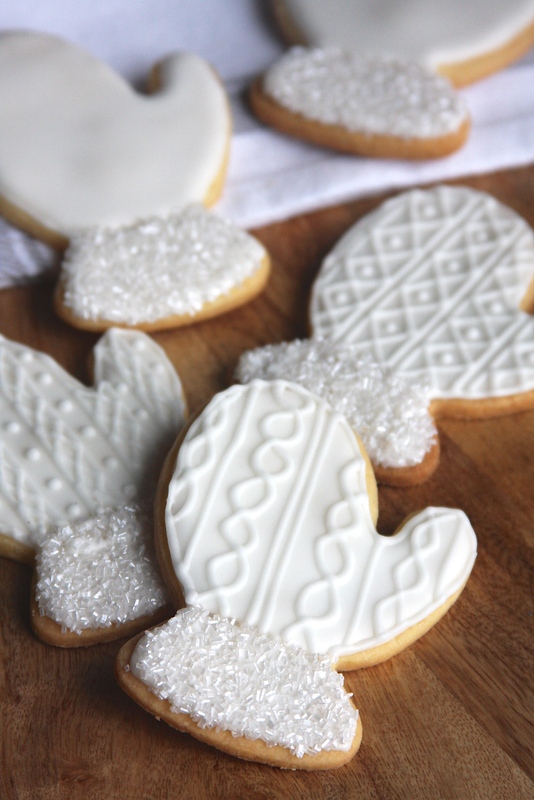 First, bake your sugar cookies and let them cool completely. Next, make your icing. I used the same icing recipe as I did for my gingerbread house, but I made it a little thinner by adding less confectioners’ sugar, so that it would be easily spreadable. If you’re using this recipe, make sure to add the confectioners’ sugar in batches, adding just enough to get the desired consistency and thickness. Once you have your icing, fill your piping bag with it, and cut it at the end. 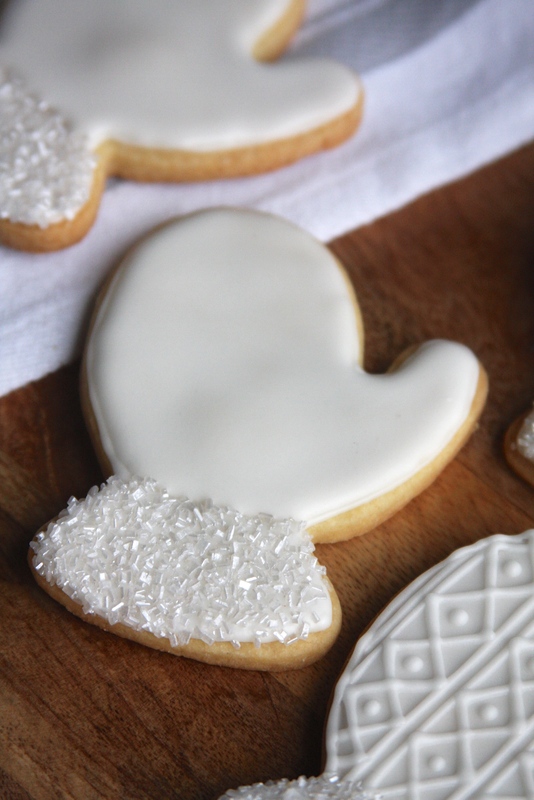 Pipe the heart outline first, then flood the cookie evenly to get a nice, smooth surface. I always tap the cookie on the table surface a couple times, just to make sure there are no bubbles in the icing and it dries nicely. You will need to let the icing set completely, I let mine set overnight so that the surface would be completely dry and hardened and ready for you to paint on! So when the icing has dried and you’re ready to paint, get your food coloring out and use a plate as your paint palette. This is where the watercolor technique comes into play – you add a little bit of the food coloring to the plate and thin it out with water, and using a clean paintbrush, paint your designs on the icing! Make sure you paint very lightly and gently over the icing so as not to pierce or damage the surface. 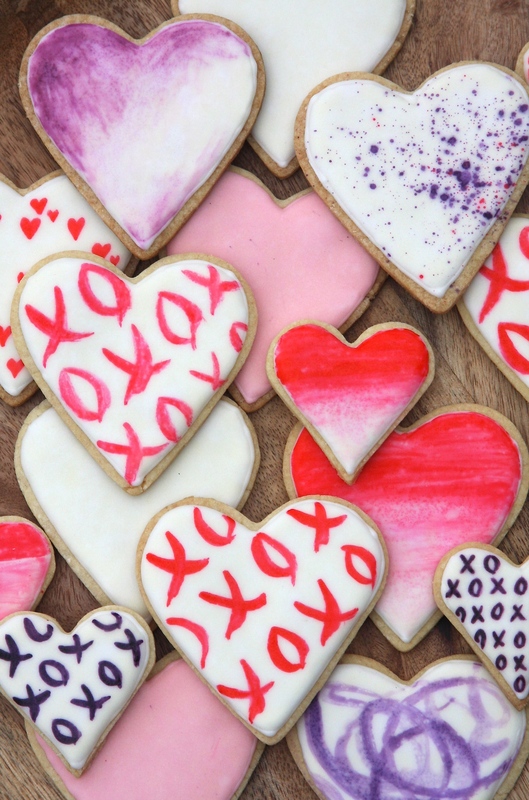 I just did simple Valentine’s themed designs on my cookies, but you can get really creative with this, and use this cookie technique for any season! I hope you all have a great, sunny February weekend! Happy Baking! Hey Everyone, I hope you’ve all had a good week! The sun finally came back out this week after what feels like a lifetime, and it’s crazy what a difference it instantly makes in your day. Of course it’s gone again now, but the sunny skies were nice while they lasted! They remind me how much I love the spring, and that it can’t get here fast enough. Fresh flowers always feel like the best way to bring a little life and color into your home, so on one of those dark January afternoons this week, I picked up a bunch of flowers and created this simple arrangement that I’m sharing with you today… Because some days need all the brightening up they can get! Do you have those creative things that just feed your soul? This is one of mine. I could spend hours in my kitchen cutting flower stems, arranging different flowers together and watching an empty container transform into something beautiful. 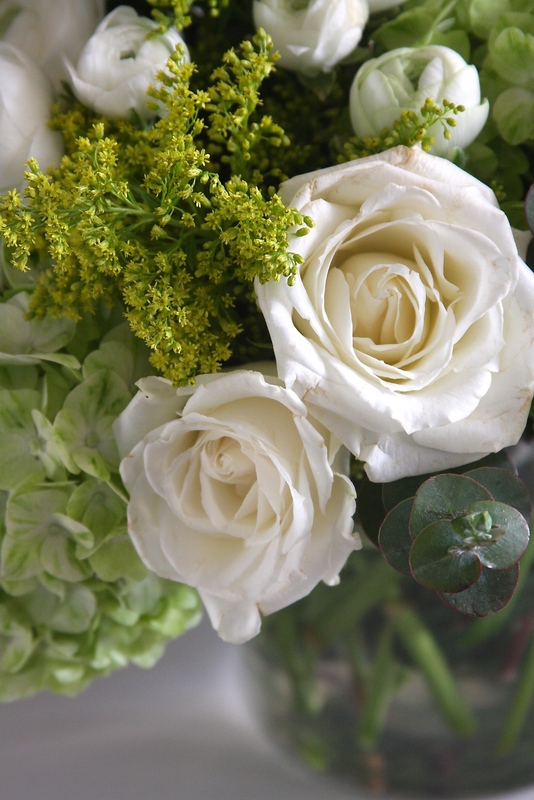 Sometimes the simplest touches like a beautiful flower arrangement sitting on a stack of books on your coffee table, or next to a big bowl of fresh fruit on your kitchen counter or placed in the center of a casually set dining table with some candles makes such a difference in a space and in your day! 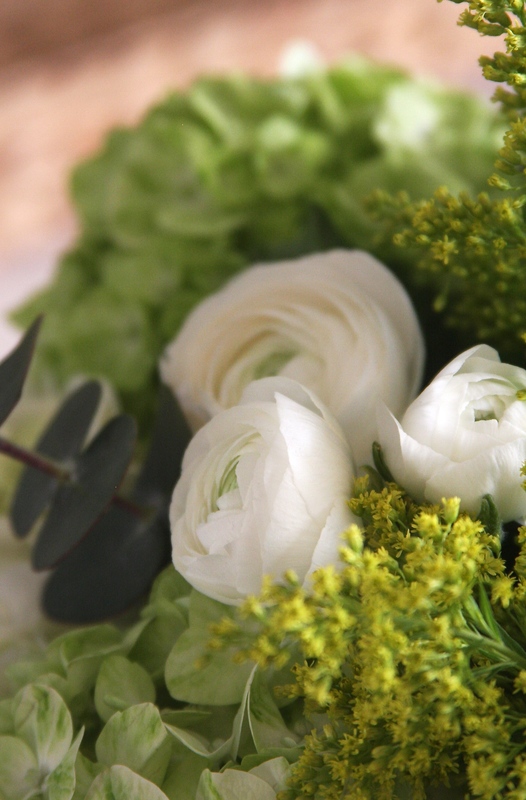 Fresh flowers instantly brighten a room and in the cold, dark winter months, they’re such an easy way to brighten your home! 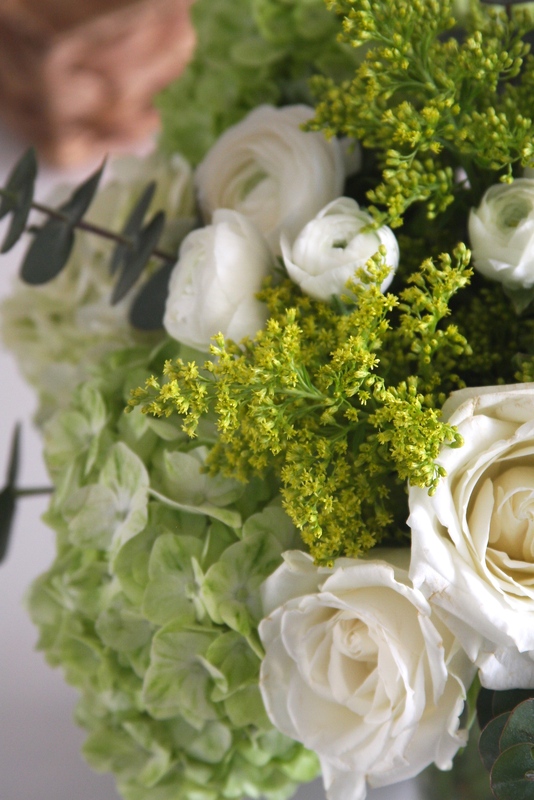 To create this arrangement, I picked up a variety of different flowers and channeling my inner Ina Garten, I stuck to a simple color palette of just greens and whites. It makes the arrangement look fresh and elegant, and since Ina always knows what she’s talking about, I’m sticking with her advice! 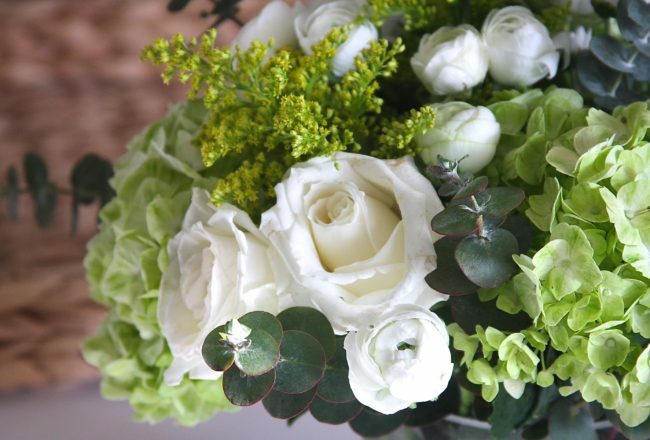 I picked up some green and white hydrangeas, ranunculus (one of my all-time favorites! ), eucalyptus (a current favorite!) 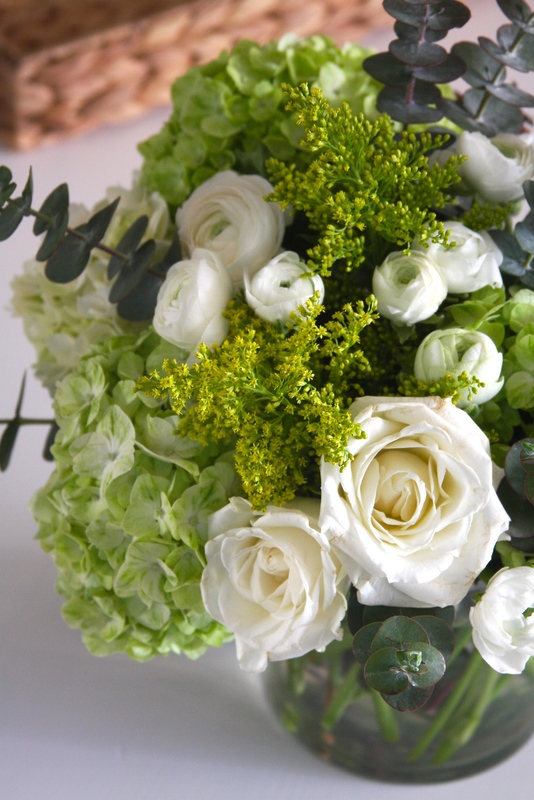 and white roses with mixed greenery, but there are so many other beautiful flower options and color palettes that you could go with instead! I always like to use a low glass vase, either round or square because it lets you create an arrangement that’s the perfect height to have on your dining table (people can still see each other across the table). Small glass containers like this are great to have on hand – if you have a round dining table you could make one larger arrangement for the center of the table, or if you have a longer rectangular table, you could use several of these low containers to line the center of the table! I wanted the flower arrangement to look nice and full, so I used the hydrangeas and white roses as the bulkier space fillers. I started with those, adding a couple hydrangeas around the outside, then adding in some of the white roses, and gradually building the arrangement. 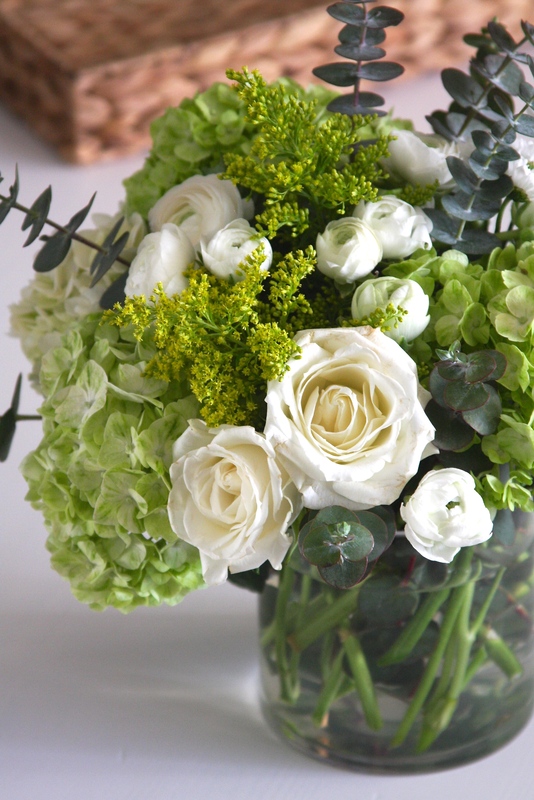 I then started adding in the more delicate, smaller flowers (like the ranunculus) and where the arrangement needed some height I added in the eucalyptus. It’s really just an organic, creative process of creating a balanced, full looking arrangement. If you want to create a simple centerpiece for a dinner party or are looking for DIY centerpiece ideas for an event or wedding, something like this is an easy to do, beautiful option – it took me about 20 minutes and under $25 (thanks, Trader Joe’s! This isn’t a sponsored post or anything, it’s just where I usually buy flowers…) to create this arrangement! I hope you all have a great (and hopefully sunny!) weekend! This is one of those weekends that I feel like I need to catch up on life… there are piles of laundry to do and a (creative – ha!) mess in my office I need to clean up among other things! As always, thank you so much for stopping by today, I hope you have a great day! See you back here again soon! First, bake your cookies and let them cool completely. 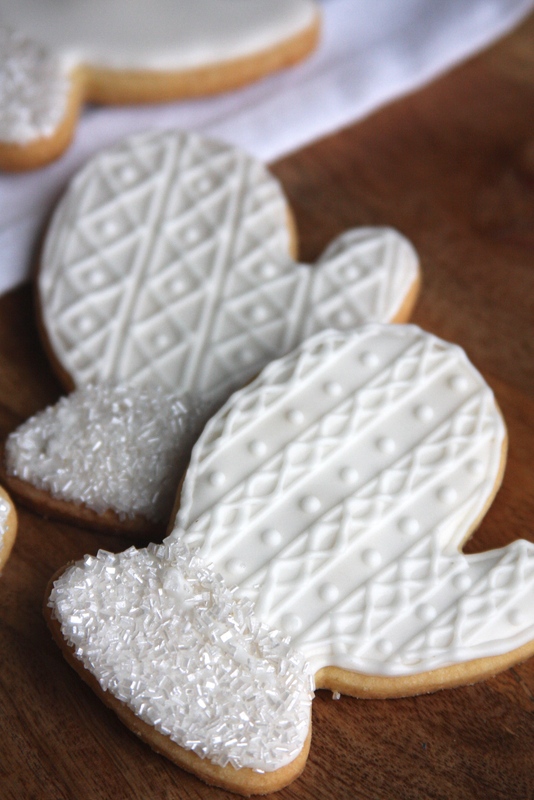 Make sure you give them enough time to cool, you don’t want the icing to melt all over them! Next, make your icing. You can use any basic white icing recipe; I used this one, which is the same recipe that I used for my gingerbread house, only I changed the amount of confectioners’ sugar to make it less thick and more easily spreadable. If you use this recipe, add the confectioners’ sugar a little bit at a time, adding just enough to make it your desired consistency and thickness (also taste it to see if it’s good!). I also only used about half of this recipe for all the cookies. 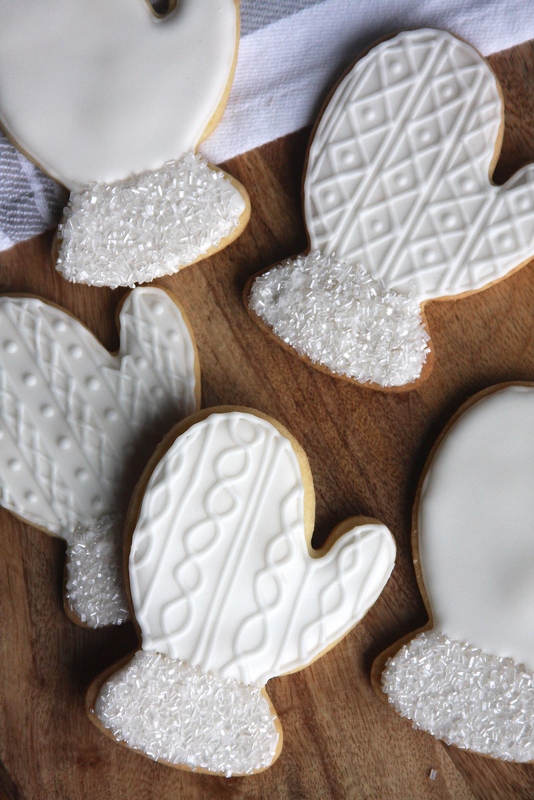 Once your cookies are completely cooled and your icing is ready, fill a plastic piping bag with some of the icing and cut the end of the piping bag. Next, pipe the outline of the mitten. Then, flood the inside part of the bottom of the mitten (the part that’s going to be covered with the shimmering sugar), and immediately shake the shimmering sugar over the whole area. Let it sit for a couple seconds, then shake the excess sugar off. 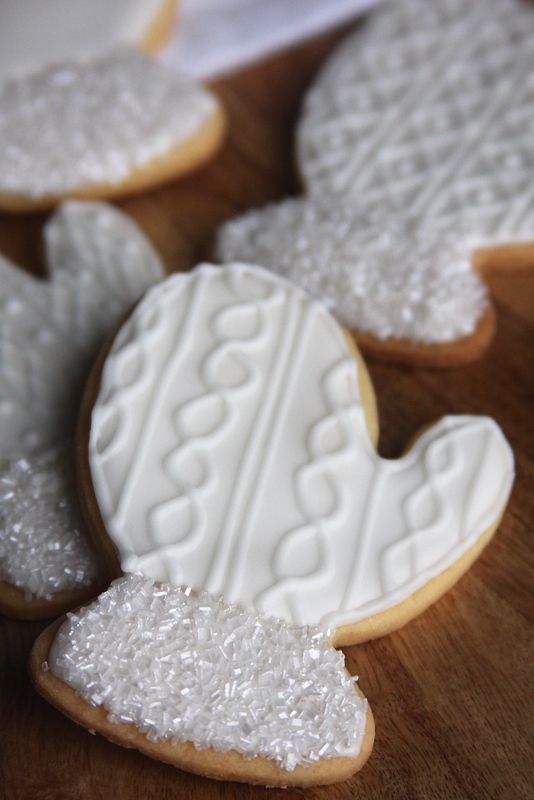 Next, flood the whole surface of the mitten with icing, and let the icing set completely. Once I flood the cookie with icing, I like to tap it gently on the table surface, just to make sure there are no small bubbles in the icing. 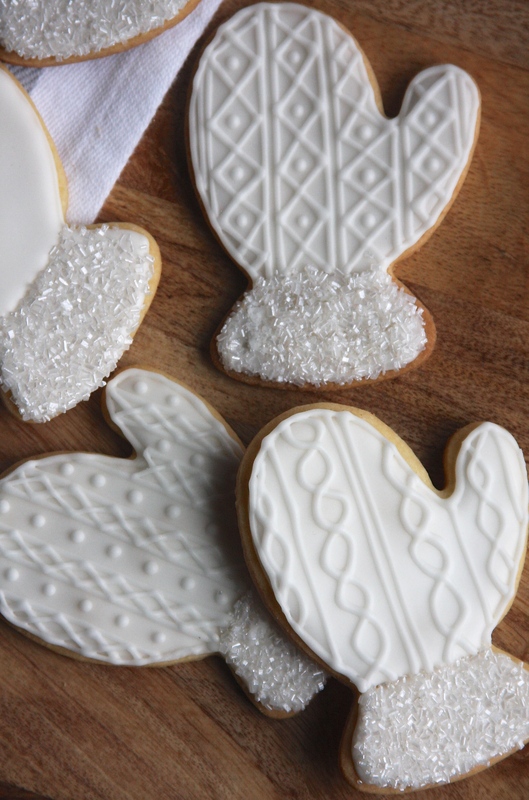 Once the icing has set, you can pipe on some of the detailing. I did a couple different sweater patterns on the mittens (just making it up as I went along..!) and then piped an outline around the mitten to make it nice and neat. Let the icing set completely and you’re done! 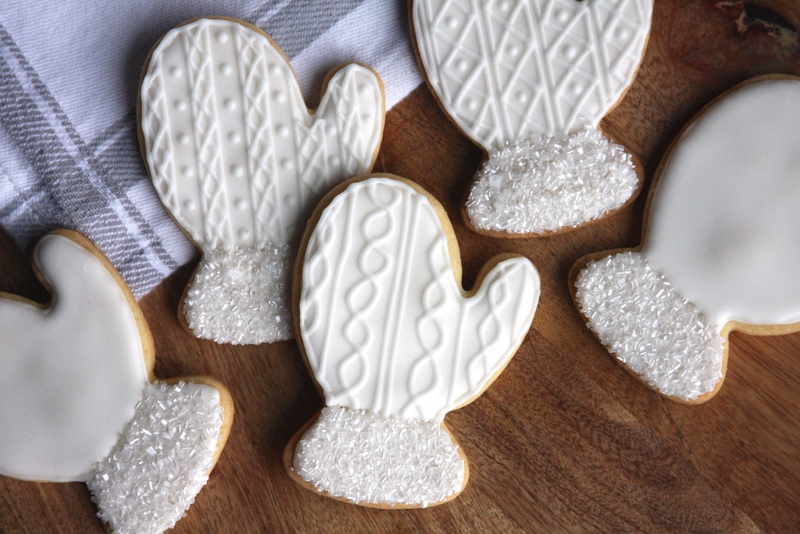 You could of course make the mittens all colorful with different colored icing or shimmering sugar, I just liked the wintery white look here… the possibilities are endless though! Happy Baking! I hope you all have a great week, thanks for stopping by today! Come back again soon! 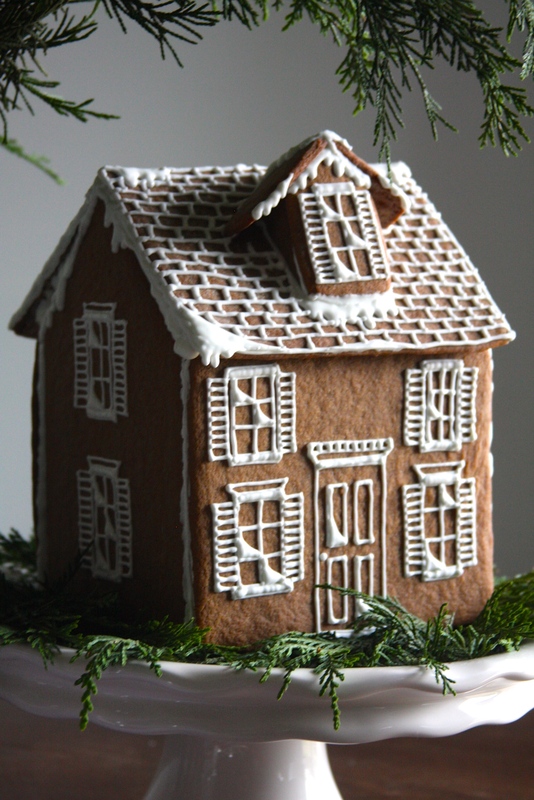 I always start out with a picture in my head of what I want my gingerbread house to look like… I’ve never really followed a picture or an example, but there are so many out there that you can use for guidance and inspiration! I drew a couple rough sketches of what I wanted to make, and then made templates out of card stock (*Tip: save those templates for next year! It’ll save you time if you want to make a similar looking house again). The process of making a gingerbread house can be pretty time consuming, so one of my favorite shortcuts is to use a store-bought gingerbread cookie mix. I almost always make everything from scratch, but for the sake of time, I always use a mix for this dough! 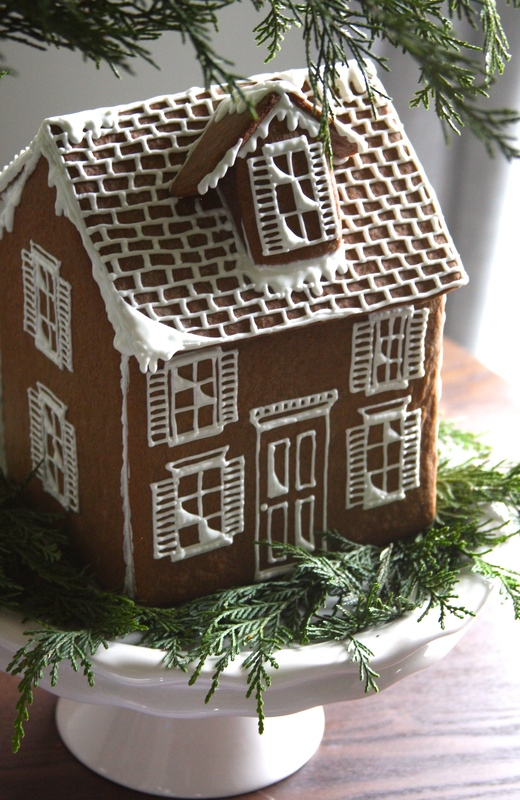 (I used one package of gingerbread cookie dough mix for this house.) I roll out the dough pretty thin, then lay the templates on top and carefully cut around them, then transfer them onto a parchment paper lined baking sheet. Baking time will vary for the different pieces (longer for larger pieces, shorter for the smaller ones), so just watch your oven! 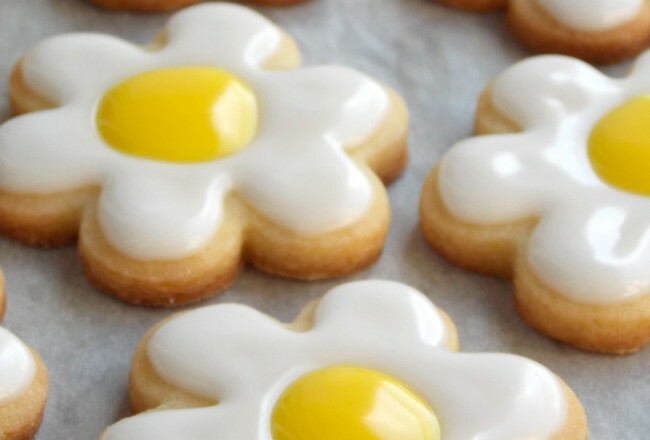 Make sure all the pieces are completely cooled before you start, you could even bake everything off the night before. I’ve played around with different icing recipes, but this year I used this one, with just a slight alteration – I didn’t use quite as much sugar. This is another thing that you just need to play around with. Add the sugar in portions, adding just enough to make the icing thick enough so it’s not runny anymore, but not too thick where it won’t go through a piping bag. My biggest tip is definitely to decorate each face and piece of the gingerbread house BEFORE putting it together! It is so much easier to have the pieces laying on a flat surface than trying to do it once it’s all put together! I like to cut the tip of the piping bag as little as possible so I can get really thin lines, it just makes everything look cleaner. Once you’ve decorated all the sides, the fun part begins… trying to put everything together! This is honestly the part when I tell myself I will never make one of these ever again, because trying to get all the parts to stick together can be a serious nightmare! This is why you need your icing to be pretty thick, so it can act as the glue and it doesn’t run all over the place. Build the four walls first – it’s a good idea to have heavy things like cans or bottles on hand to secure the walls until the icing dries. Next, add the roof and any other pieces on top. 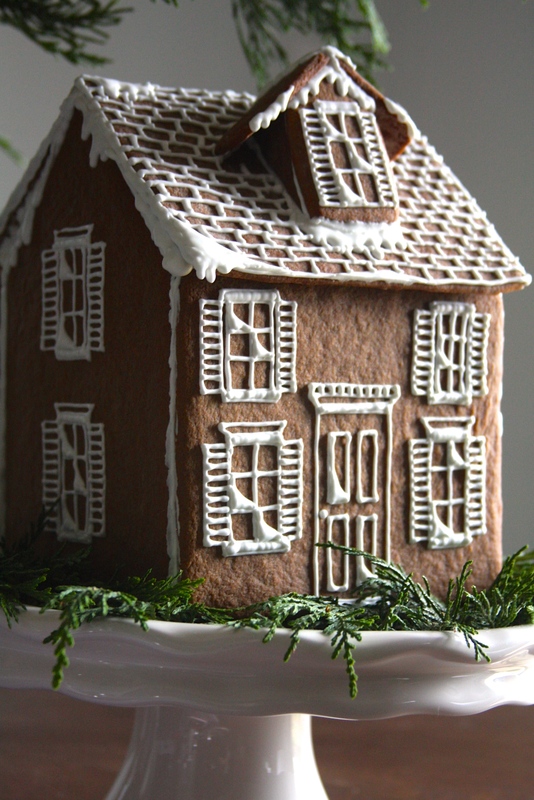 It’s probably a good idea to build the house on whatever surface you’ll be displaying it on, so you don’t risk it falling apart when you move it, but if you do move it, just make sure all the icing has set and dried completely. I carefully moved mine onto a white cake stand that I lined with some fresh greens for a clean & simple look. And that’s pretty much all there is to it! I hope you have fun making your gingerbread house if you make one, and enjoy all your Christmas traditions that make the holiday season so special! Thanks so much for stopping by today, have a wonderful week! Hi Everyone! I hope you’ve all had a great weekend! It’s hard to believe that November is almost here, especially given the fact that it’s been so unseasonably warm this fall. 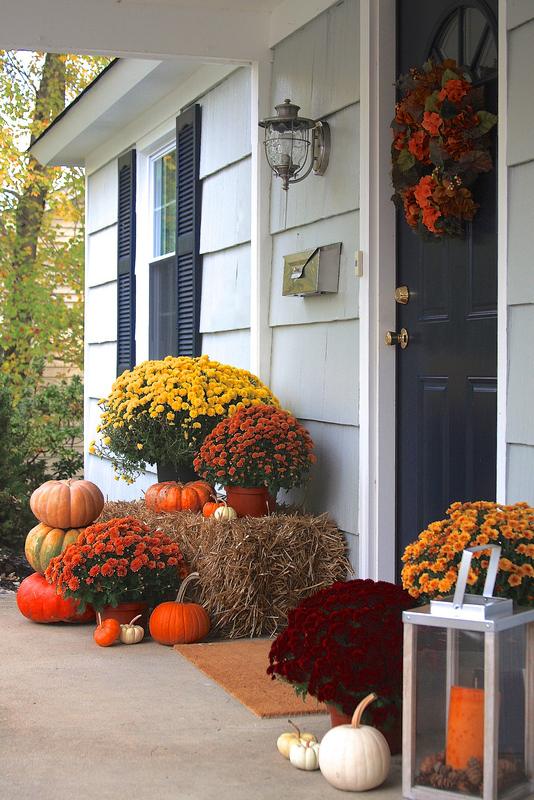 We spent the majority of September painting the exterior of our house, and now that it’s all finally done, it’s been so fun adding some fall touches to the front porch! The interior of the house is just as important too. A friend of mine has renovated their bedroom, new bedding equals a new mattresses. That is the best feeling. She looked into something like leesa vs casper mattress and compared the two to see which was the best product in her opinion. She still loves it till this day. Back to the exterior- I thought I would show you a little bit of it today. Painting the house was a much bigger project than we expected (as most house projects have been so far…!) but it’s definitely been worth it. We bought our first home, a cape cod style house, last summer, so we’ve been here for a little over a year now and we’re finally getting around to working on some of the projects we’ve been wanting to do since we moved in. Our house was a pretty saturated yellow color when we first bought it, and although it was cute (and easy to spot when driving up the hill on our street!) we wanted to tone the colors down a little and paint it a more neutral color. I knew I wanted to paint it light gray, and I thought navy would be the perfect color to use on the front door and window shutters to complement it. 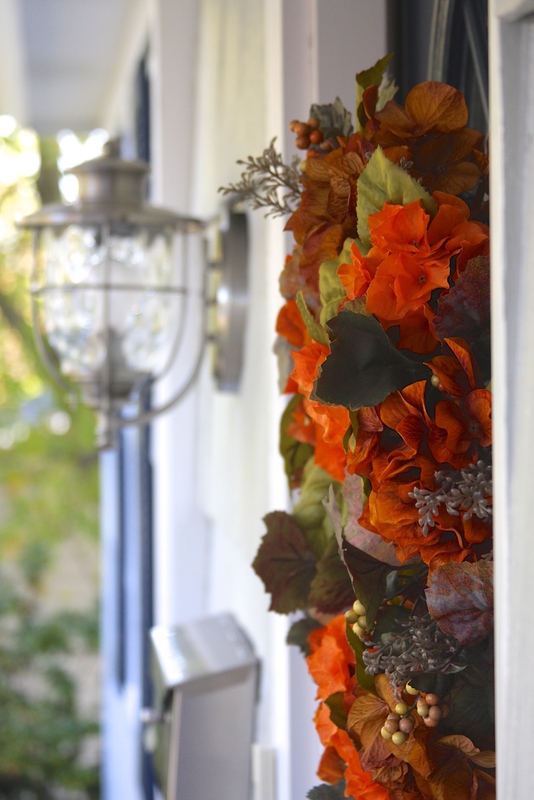 Since we were painting the house in September, I already had fall decorating in mind, and the gray and navy colors worked out to be the perfect backdrop for all the fall oranges, reds and yellows! As for the paint colors we used on the house, that’s a whole other long story… If you’re very particular when it comes to colors, or if you’ve ever just tried picking paint colors for your house, you will know how overwhelming it can be! I went through gazillions of grays to find the perfect gray, only to find that it was way too light when we started painting. Of course I realized that after I had already bought several gallons of it… One of these days I will learn to buy paint samples and save myself (and my poor husband…) hours of frustration! So back to the store it went to be tinted and darkened. Thankfully it’s much easier to make a color darker than it is lighter! I’ve frantically taken gallons of paint back to the store to get them lightened only to find out how hard it is; this was luckily the opposite case and a pretty easy fix. The gray paint color we used is called Stone Eagle, by Sherwin-Williams, but we had it darkened just a tad so it’s not as light as the original color. It’s a cool, true gray color, and I’m really happy with how it finally turned out! As for the front door and the window shutters, I ended up going with Naval, also by Sherwin-Williams. If it wasn’t for my friend having gone through various renovations around her home, I wouldn’t even have considered improving the window shutters. Why this inspired me was because she looked into a company like Shuttercraft, where she mentioned how she was able to achieve her dream aesthetic to suit her home. This is all anyone wants when it comes to redecorating. There were a couple different navy paint colors I was deciding between, but this looked like a true navy to me, that was still vibrant and blue, for a lack of a better description, as opposed to others that were almost black or had purple undertones to them. We did several coats of it on both our window shutters and the front door, and I’m really happy with how it looks against the light gray, it really pops! 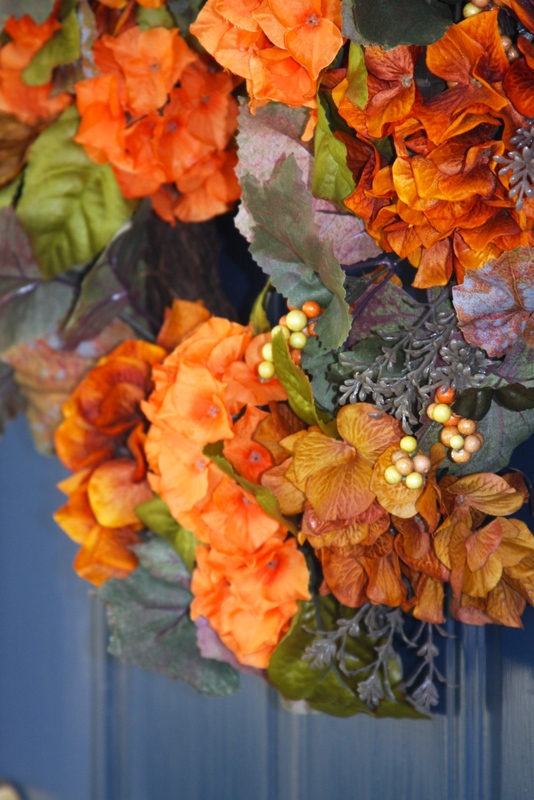 I love the way it looks with the fall colors right now, and I’m thinking it’ll be a great backdrop for Christmas decorating too, where you could pair it with traditional reds, whites, silvers or golds… but one holiday season at a time! I hope you all have a great week and that Monday treats you well… Thanks so much for stopping by today! Happy Fall! Hello, Friends! It has been a while. A little over a year, actually, since I’ve stopped by here and shared a little bit of my world with you! It has been a busy year, to say the least, but I’ve missed blogging and thought it was about time I got back into it. 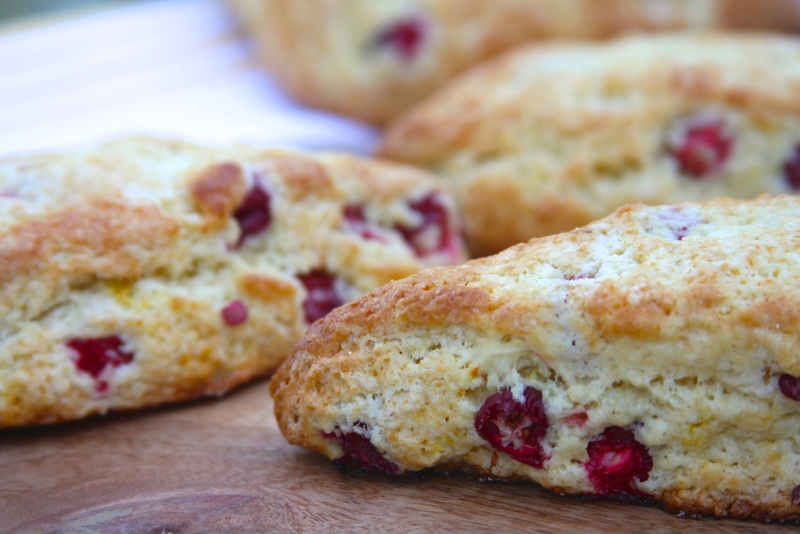 I made these Cranberry Orange Scones last week, and thought they would be the perfect thing to share with you today! 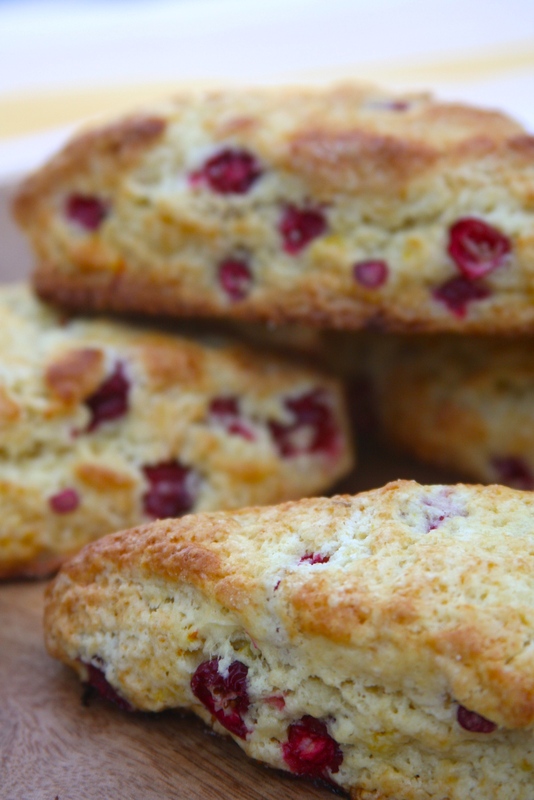 If you’re a scone lover, you will love these! I’ve tried so many different scone recipes, and I love the consistency of these. They are soft and buttery on the inside, bursting with fresh flavor from the tangy cranberries and fresh orange juice and zest. 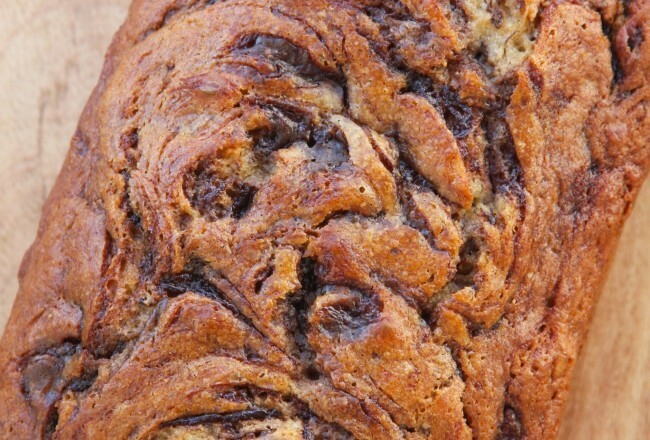 They’re the perfect fall treat with a hot cup of tea or coffee on a cozy afternoon! The recipe is from The Vermont Country Store Cookbook, which was created by the family that owns this traditional New England general store. My husband and I spent a couple days in Vermont over the holidays last year, and fell in love with the area instantly! We’ve loved every single recipe from the cookbook so far and opening it always brings back memories of the cold, snowy days we spent up there; driving on remote snow covered country roads, walking through quaint little towns filled with New England charm, eating the sharpest cheddar cheese and every meal involving maple syrup in some form or another! On our way to the little Bed & Breakfast we were staying at, we stopped for dinner and at the end of our meal we ordered the richest, most decadent bread pudding I have ever had, that was drowned in a thick pool of maple syrup. Since it was late and the roads were getting pretty icy, we took it to go, and within about two minutes I managed to spill the maple syrup all over the front seat of the car… needless to say, it was a sticky mess for the rest of the trip. A sweet smelling sticky mess, thanks to which the smell of maple syrup will always remind me of Vermont and that perfect snowy Christmas! 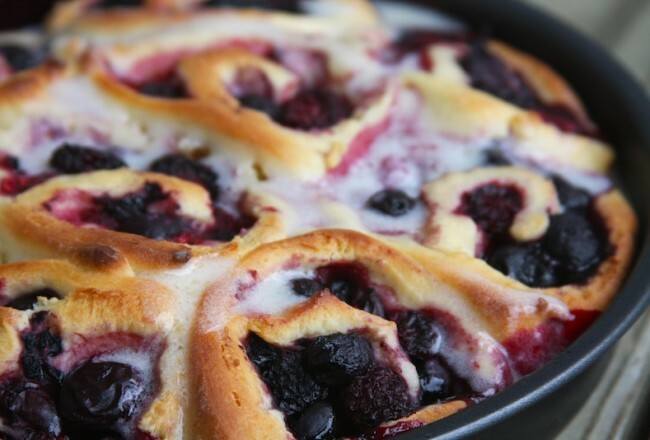 Sometimes the worst messes turn into the best memories… But back to the scones! Using a wooden spoon, gently stir in the fresh cranberries and the grated orange zest. In another smaller bowl, whisk together the egg, heavy cream and orange juice, then pour it into the flour mixture while gently stirring just until a dough forms. Preheat your oven to 425 deg F and line two baking sheets with parchment paper. Turn the dough out onto a lightly floured surface and form into a rectangle about 2 inches high. With a knife, cut the dough into 6 equal sized triangle shaped scones. Place the scones on the parchment paper lined baking sheets leaving enough room in between them, as they will definitely rise and get bigger as they bake! Pat the scones down just a little, and brush the tops with a little bit of milk and sprinkle generously with sugar. Bake the scones for about 18 – 20 minutes, until they are lightly browned on top and around the edges (watch them carefully the last couple of minutes so they don’t burn!) Once baked, let them cool for a couple minutes before eating! *Note: The original recipe is for 12 scones, so simply double this recipe if you want to make 12! They are definitely best eaten fresh and preferably the same day as you baked them (which won’t be hard to do, trust me!) but you can definitely store them in an airtight container and they will be good for a day or two! Thank you so much for stopping by A Homemade Living today! I promise I’ll be back again soon! 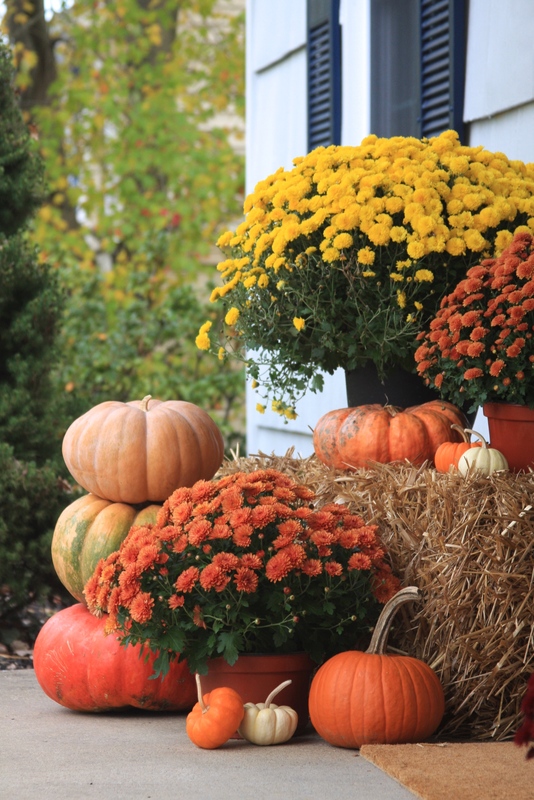 I hope you have a great rest of your day, and that you’re enjoying some beautiful fall weather wherever you are! Hi Everyone! I wanted to share this simple and easy idea for framed family recipes with you today! A couple of weeks ago, we moved into a new house and even though there are still a couple boxes to be unpacked, furniture to be bought and things to be fixed, it is slowly turning into the home that I had envisioned when we first bought it. When it comes to interior design and creating your home, I think it’s all about layers. You begin with the basics, your walls, your floors, your furniture… and then you begin to build more layers – you start introducing more colors, more textures, more accessories, and all the personal touches that really make a home come to life and give it its heartbeat. I have a big stash of old family recipes that I somehow wanted to display in our kitchen and dining area. Some, like the one in the photo above, were handwritten by my great-grandmother in the early 1940’s, some were written out on a typewriter by my grandmother, and others are cut-outs from old newspapers, cookbooks and pamphlets. What I find so interesting is how much you can truly see into the lives of the people of the time just by reading through their recipe books. 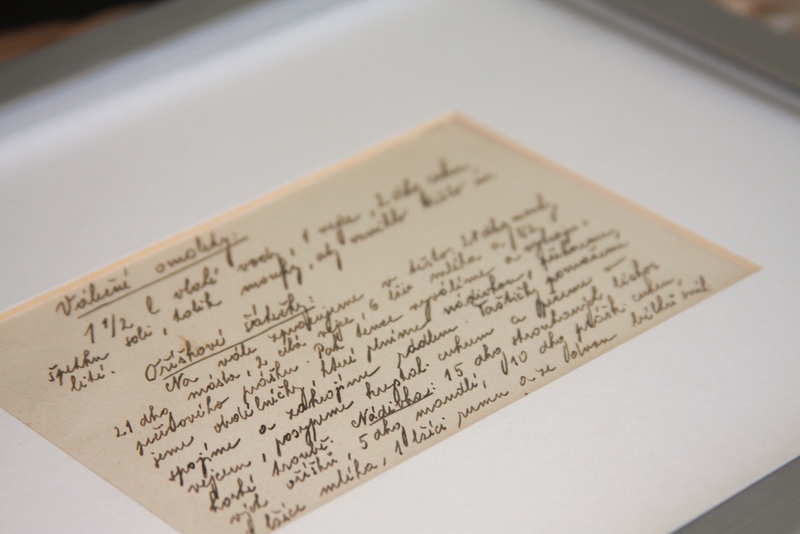 The handwritten Czech recipe above, as many others in my great-grandmother’s notebook, is entitled “Wartime recipe for…” From reading the ingredients, you can see what there was a shortage of at the time and how creative cooks became with learning to substitute various more readily available ingredients for the more sparse and expensive ones. Many of the recipes are for meatless dishes, and many use beans and potatoes (including desserts! — pastry cream out of white beans! ), since that was what was available. There are many personal stories that you can begin to see as you read between the lines of many of these recipes too. 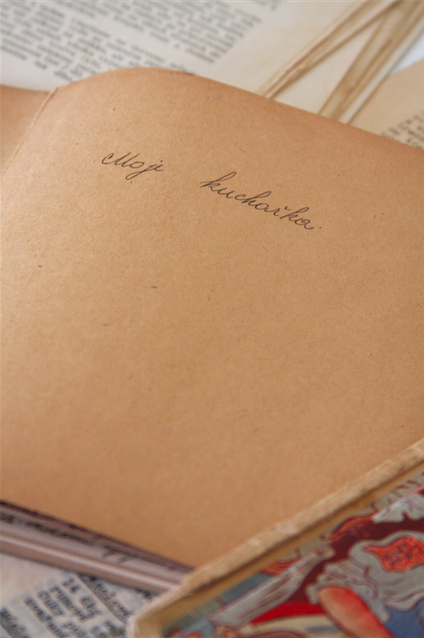 As a single woman living before the outbreak of the Second World War, my great-grandmother moved to England from Czechoslovakia, and several of the recipes I read in her notebook that she wrote later as a married woman upon her return home were clearly culinary memories of her years in London. These recipes, not just in their physical written form, have travelled many miles, countries and continents, and as I hang them up on my wall here on the other side of the Atlantic Ocean, I wonder which of our current family favorites will survive the test of time, and where life will take them one day! This simple craft idea really needs no directions or explaining. All you need is a picture frame and your recipe. I think adding a mat elevates the framed recipes a little bit, and gives them a clean, crisp look. If you don’t want to use the original recipe, you may want to just scan it, adjust the size, then print it out and frame it. Another fun idea may be to print a scanned copy of the recipe for family members, frame each copy and give them away as gifts (along with the cooked/baked recipe!) – a fun holiday gift idea! What are your favorite family recipes? I would love to know! Thank you so much for stopping by today, I hope you all have a wonderful rest of your week!